If you enjoy pub games like Dart 'm Up and other such things, then this conversion of a classic drinking experience will be right up your alley. It's perhaps not quite as rowdy as the real-world game but requires just as much skill and makes for a good time, especially when played in company. It's basically an alcohol-fueled version of bowling, where fifteen paper cups filled with beer are arranged in a similar fashion to ten-pin bowling, and with enough for two teams. The goal is simply to land a ping pong ball in your opponent's cups, one at a time. When a ball lands in a cup, the owning team removes it by drinking down the beer, which then obviously has something of an effect on their subsequent performance (in the real world anyway). Once all cups are removed by one team, the loser is then forced to down all remaining cups, resulting in much hilarity all round. The whole thing is controlled by a very simple interface, which allows you to control the power and direction of your throw with ease but which is tricky to master. That's pretty much it for the game to be honest, and if played solo it is largely unsatisfying experience. However, when played in company it becomes a riotous and enjoyable experience. It's bolstered by some pretty sound physics, which is immensely important for such a thing and which helps add an element of realism to proceedings. 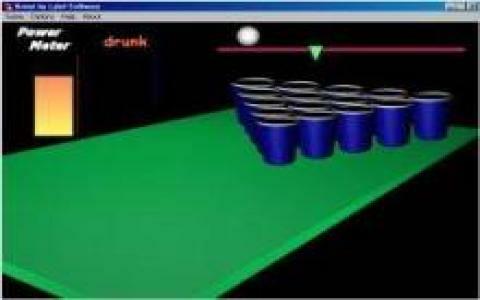 This is far from a classic, but if you are looking for a good party game and don't have access to real beer, then take a look here.